Hello! I'm pretty excited about today's post so I'll just jump right in. I'm introducing a new feature on my blog called Tutorial Tuesdays where I'll post a new photo tutorial each week. I get a lot requests to do tutorials but videos take way too much time to film and edit. These photo tutorials are much easier for me to do, so hopefully they're helpful to you! I'd love to hear your suggestions for future tutorials as well! The colours I used in this manicure are American Apparel T-Shirt, American Apparel L'Esprit, American Apparel Summer Peach, American Apparel Rose Bowl, American Apparel Manila, and Essie Navigate Her. Keep reading for the tutorial! Start with your base coat and colour, and let that dry. Use a dotting tool to make 5-petal flowers all over your nail, leaving space between them for leaves. 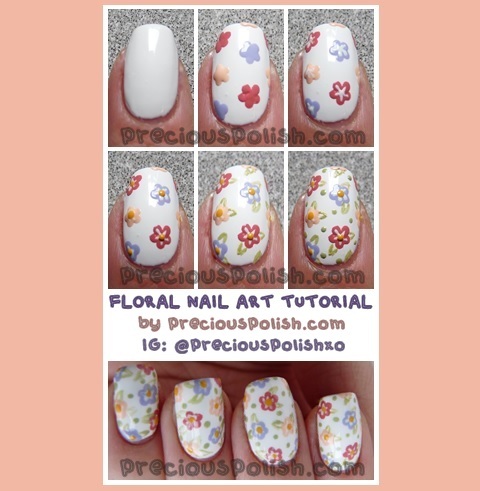 Use a striping brush and a contrasting polish to add detail to the petals. You can also do this with a smaller dotting tool or a toothpick. Use a dotting tool to create one dot in the center of each flower. Use a striping brush to create the leaves by making small V shapes. Create two leaves per flower. Use a dotting tool to fill in any spaces with dots. Seal with topcoat, clean up, and you're done! Hola guapa! acabo de descubrir tu blog y he de decirte que me encanta! Te sigo desde ya para no perderme nada. Te invito a que te pases por mi blog de uñas.